At Tuesday night’s Planning & Zoning meeting, residents waited five hours to speak about an application to develop 345 West Putnam Ave, the site of the Post Road Iron Works, a steel fabrication plant in operation for the better part of a century. The applicant has proposed a 355-unit “pedestal building” with five stories of apartments over two levels of underground parking. Though P&Z won’t make a decision on either a preliminary or final site plan until the Wetlands agency makes its decision, the commission was required to “open” the application at a public hearing within a time frame determined by statute. And so the five-hour marathon began. The heart of the issue – if the application gets Wetlands approval – is whether the state’s affordable housing act, section 830g, exempts the applicant from town regulations to the extent they request. A municipality is subject the affordable housing act statute 830g if there is less than 10% affordable housing, which is the case in Greenwich. Attorney for the applicant Robert Berchem said 30% of the units would be rented to families as affordable – half of those units going to families with income less than or equal to 80% of the state median income, and half set aside for those with 60% of state median income. The state median is $89,000+ and Greenwich median is $127,000+. The affordable apartments restrictions would be in effect for 40 years. “The code change is a sea change in character of the town,” Chris von Keyserling said some time after midnight. He suggested such a major change would require an RTM vote. Peter Alexander, a local landscape architect, characterized the affordable housing act as social engineering. “Do you know how political this is?” he asked. Mr. Alexander lamented Greenwich’s march from town to city, beginning 50 years ago with the construction of Greenwich Plaza. As expert after expert testified, newly elected P&Z chair Richard Maitland repeatedly asked was how the applicant had come up with the proposed total of 355 units? Maitland said that under current regulations, his calculation comes to about 80 units. Expert after expert declined to answer, including engineer Ted Hart, wastewater expert Tom Knowlton, both of Milone & MacBroom; and Ray Sullivan of The Sullivan Architectural Group. “Yes, it is different from what you would normally see in Greenwich. That’s why we’re here under 830g,” Berchem said to a chorus of laughter from the audience. “But somehow your solution does all of that,” Mr. Maitland said. “You have just described what it will do to the character of the community.” He asked whether a more modest project would fall under 830g? The architect, Mr. Sullivan of Sullivan Architectural Group, whose project portfolio includes Avalon Bay in Ossining, NY and The Mariner in Port Chester, said the units range from studios to three bedrooms. Sullivan said, on average, the proposed studios would be 575 sq ft. One-bedrooms would be 750 sq ft. Two-bedrooms would range from 980 to 1,050 sq ft. Three bedrooms would be between 1,150 and 1,300 sq ft.
Sullivan pointed to the rendering of the proposed building and a series of retaining walls ranging from 8 ft to 12 ft in height. He said there would be two generators in the underground parking lot to power the elevators, which are considered exits in emergencies. He said the building will have a pool, but no outdoor amenities – just two interior courtyards (100 x 100 ft each) and one 5 ft balcony on each unit. Residents questioned the traffic impact on West Putnam Ave, the impact on the character of the neighborhood, and whether the two small interior court yards and modest balconies would provide families adequate light and air. John Ryan, a Weaver Street resident who waited until after midnight to speak, pointed out that there is neither a park nor a playground in walking distance. What is in walking distance are fast food restaurants. “Can you imaging 900 residents wanting to go to Wendy’s or McDonald’s?” he asked, comparing that to the familiar sight of Mercedes employees making the treacherous crossing of four lanes on West Putnam Ave. He said if he lived in the proposed building he would never let his kids walk to school. Triton Environmental, Senior VP, who is a Licensed Environmental Professional (LEP,) Carver Glezen, said his firm has experience remediating industrial sites for residential development. Katie DeLuca asked whether the state would require permits and monitor the remediation. Mr. Glezen, who characterized the cleanup of the site as “a straightforward remediation,” said no state oversight is required, but rather, in his role as an LEP, he would serve as “an arm of the state,” which elicited another round of murmurs from the audience. 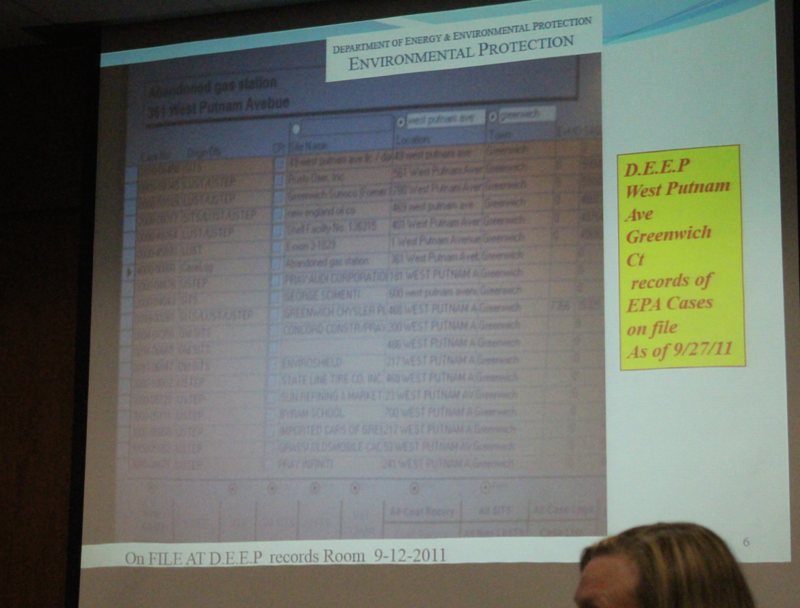 Glezen said residential standards were applied to recent testing, which did not find the groundwater to be contaminated. He said they did discover two areas of soil contamination and “some lower level contamination.” He said the three buildings on site – maintenance building, painting building and fabrication building – would be remediated before being demolished. Tom Knowlton, a wastewater expert at Milone & MacBroom, said he conducted the waste water evaluation for the project. “We performed a downstream capacity analysis with the assumption we can connect into the 8″ sewer main on West Putnam Ave. That would flow through pipe the connects to the Horseneck Brook sewer, which is to the east of the site,” Knowlton said. Mr. Maitland said that the Town sewer department indicated they do not recommend approval of this project at this time. Knowlton said peak flow events Horseneck Brook sewer occur after rainfall, and that the proposed building would result in additional flow. He acknowledged that during “peak flow” events, three segments of the Horseneck Brook sewer are over-capacity. Intervenor Nick Cataldo, a neighbor, presented a slide show illustrating examples of contamination in the West Putnam Ave corridor, including a list of DEEP contaminated sites including an abandoned gas station at 361 West Putnam Ave.
Milone and MacBroom engineer Ted Hart, described the development as low impact because it would result in less impervious surface than the Iron Works. “We used low impact development techniques,” he said, point to the building’s green roof. “Your plan is to remove 208 trees of 6″ diameter or more,” Mr. Maitland said, characterizing the planting plan as woefully inadequate. And, he pointed out there is no plan for outdoor recreation beyond the two interior courtyards which wouldn’t be accessible when they’re filled with snow. “It’s really the building that is their living environment,” Mr. Hart replied, adding that tenants could drive to town parks. Barbara Huber, of 24 Oak Street, a parent of children in Greenwich Public Schools said the proposed apartment building is zoned for Glenville School, Western Middle School, and of course, Greenwich High School. Where would the children play? Mrs. Huber questioned where the children would play and where tenants would walk their dogs. She also questioned whether Glenville School could accommodate a big influx of children, and reminded everyone of the district’s policy not to provide school bus service for those within 1-1/2 miles of school. Huber said that, like her children, those in the proposed building would choose between making the treacherous walk for nearly a mile down West Putnam Ave to Western Middle School or be driven. She noted there is no crossing guard until the State Line Deli by Western Jr Highway. She said that pickup and drop off at Western Middle School is already a jam on a daily basis. And, she noted, in the area of the Post Road Iron Works, in the morning, the school bus stop for GHS students is on the other side of West Putnam Ave, and all those children will have to cross four lanes of traffic to get to it. Another parent, Carrie Breed, registered as an intervenor representing GNPA, said her young family lives adjacent to the site and enjoys peace and quiet, plus the sounds of the the ponds at night. Like Mr. Darden did at the Wetlands hearing last Monday, she played a tape recording of of a chorus of frogs. “It’s a peaceful environment now,” she said, surmising that a 533 apartment building will bring sounds of car alarms, sirens, ambulances and people partying on hundreds of balconies. “This is not why people move to Connecticut,” said commissioner Mrs. Alban. “You might as well stay in a major metropolitan area,” she said to a round of audience applause. Alban said that beyond 83og, the commissioners concerns are for the health and safety of the people who will occupy this building. Picking apart specifics, the commissioners pointed out the calculations for parking didn’t comply with the formula used in Greenwich, and there weren’t enough proposed handicapped spots either. Commissioners said there is zero chance to park on Putnam Ave if parking if parking at the apartment building is full. Former Selectwoman Lin Lavery said she objected to the text amendment for affordable housing because it has the potential of changing the character not only of the neighborhood, but of the entire Town. “How they’re using residential standards to do testing on a commercial site is incredulous,” he said. “It’s been contaminated for 100 years and the town should have professionals come in. He said the Horseneck Creek watershed can’t handle the flow, as it is already is one of the most flooded systems. He said the storm water system and old sewer systems are already at capacity and cannot accept additional flow. Furthermore, Quigley said because the harbor is silting up and the town has a huge dredging issue, a project of this magnitude would worsen the situation in the harbor. Chris von Keyserling, who muttered “Avalon” under his breath for nearly four hours, finally smiled when Nancy Ramer made a reference to that apartment development and management company. She said that of all the developments that have been litigated, including Avalon, she found nothing of the kind of density being proposed by this applicant. Around 12:30am, after all the residents had their chance at the microphone, and Mr. Berchem attempted to answer Mr. Maitland’s question about how they came up with 355 units, the meeting was adjourned. The decision was obviously left open as the application is still being considered by the Wetlands Agency. In the meantime, Commissioner Peter Levy asked Mr. Berchem if his client would reach out to the neighbors to start a dialogue. The Wetlands public hearing on this application is continued to May 9 in Greenwich Town Hall. The denial of the redevelopment by the Planning & Zoning Commission was also appealed. Judge Berger will likewise review this case.